Explore the unbeatable serenity of nature. 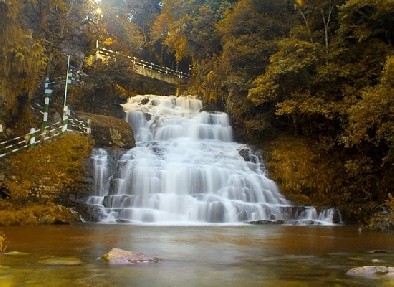 Assam Meghalaya tour package is a complete treasure for the nature lovers. This 13 Night and 14 Days itinerary will make you travel and explore the natural clearing in the regions of Guwahati, Shillong, Cherrapunji, Kaziranga, Kohima, Jorhat and Majuli. This is the most rejuvenating trip for tourists looking out for an enjoyable way to break the monotony of day-to-day life. Apart from enjoying your holidays in the lap of nature, you can also visit some of the popular attractions of the place and nearby region. On you arrival at Guwahati Airport/Railway Station, you will be welcomed by our representative and will be transferred to Shillong (100 km - 3 hrs). On the way to Shillong, have your lunch and enjoy sightseeing at Barapani Umiam Lake. This lake is very popular due to its natural setting. Being surrounded by sylvan hills, the serenity of the lake is a treat to watch. Check-in your hotel, freshen-up, and take a little rest. You can use the rest of the time to enjoy walks around the place. Halt for an overnight stay at your hotel. In the morning, post breakfast, drive to Cherrapunjee (60 kms 1 hr). Due to beautiful waterfalls, this place is popular as the wettest place in the world. Guided tour to Nohkalikai waterfall and caves in and around Cherrapunjee. While your return to Shillong, you can also halt on the way at Elephanta falls and Shillong peak that offers panoramic view of the countryside being the highest point in the state. Reach your hotel for an overnight stay. Early morning, get ready for sightseeing at Shillong. 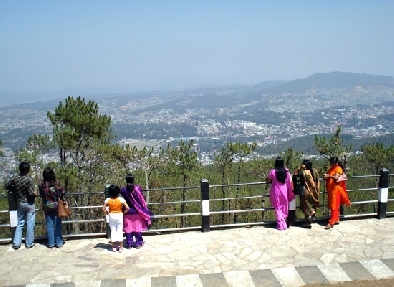 Take pleasure in admiring the beauty of Shillong that makes it popular as ‘Scotland of the East’. Earlier, this place used to be the capital of undivided Assam and dwelling place of the Khasi Highland tribes. Later, drive to Kaziranga (280 kms 5 hrs), post lunch. Check in at the tourist lodge, freshen up and take a little rest. You can take leisure walks to the nearby areas of the lodge. Return to your tourist lodge for the nightlong halt. In the morning, get ready for some adventure at the Kaziranga National Park. Explore the central regions of the park on an elephant safari. Witness some of the mesmerizing views of the park like unicorn rhino and population of other species performing their natural activities. You can also explore the area post lunch by taking jeep safari. Later, you have rest of the day to be spent at leisure. Halt for an overnight stay at your tourist Lodge. This day will be utilized to visit the tribal village and Tea Estate. At the tribal village you can experience the culture and heritage of the local tribes. 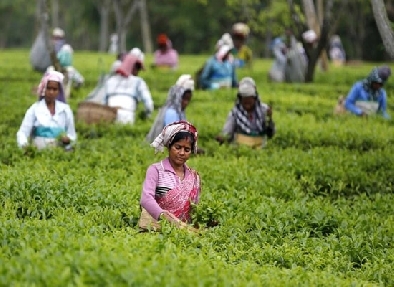 Later, at the Tea Estate, you can witness lush green tea farms and the procedure of processing of tea. Post lunch, you will explore the eastern range of Kaziranga National Park by jeep safari. Rest of the day, you can enjoy the natural settings of the place. Return to your tourist lodge for an overnight stay. In the morning, have your breakfast and later drive to Kohima (225 km 5 hrs). Halt at Kohima, have lunch, take a little rest, leisure walks and then proceed to Touphema Tourist Village (41 kms from Kohima). 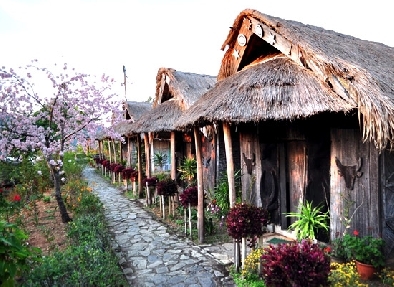 Check in at Touphema Village Resort which is managed by Angami Naga village community. Freshen up and take a little rest. You may use the time exploring the nearby areas. Return to the resort for an overnight stay. Check out from the resort after breakfast and explore the village. Later proceed to Kohima. Visit the WW II Cemetery. This place is located in the heart of Kohima town. Later, visit the State Museum at Bayani hill. 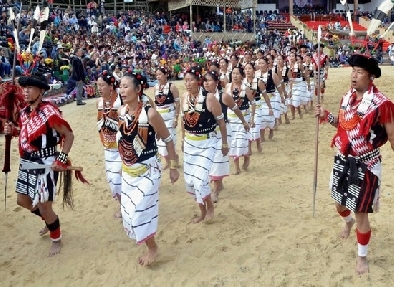 Here, you can get the sneak peek of the Naga Culture. The rich culture and heritage is also exhibited in ancient weaponry, artifacts, tools & implements, handlooms, & handicrafts, coins, gems & jewelry, etc, exhibited there. Post lunch, visit Kepfiizha (Kigwema village) Dimori Cove Guest house. This place is used as a camp for people to trek at the Japfu Peak (3048 meter Mt) Japfu. Here rhododendron tree (20 meters high) are found in abundant and this place is considered the best when it comes to trek in valley of North-East India. Later, explore the Angami village of Jakhama. Thereafter, return to Kohima, check-in to your hotel for a nightlong stay. In the morning, proceed towards Khonoma to visit Angami Tribal village. This village is the home of Angami Phizo, father of Naga Nationalist movement. The location of the village, on the top of a hillock, serves eye-pleasing view of the pastoral beauty. Explore the place, later, return to Kohima. Spend the leftover time at leisure. Take gradual walks to the lanes of Kohima. Return to your hotel for an overnight stay. In the morning, drive to the tea-capital of Assam, Jorhat (200 Kms 4 hrs). Check-in to the Thengal Mansion. This is the historic ancestral house of a tea planter. This is located at a distance of 15 km from the Jorhat city. This reflects the rich culture and tradition of Assamese. Post lunch, take a little rest. Take a leisure walk in a nearby village, explore the simplicity of the place, talk to the locals, enjoy local food, etc. Return to the Thengal Mansion for an overnight stay. In the morning, leave for Majuli. This is the World’s biggest River Island and settlement of Vaishnavite monasteries. To reach this island, you need to cross the mighty Brahmaputra on a ferry. After reaching this island, explore the natural setting of the place, take leisure walks. For an overnight stay, you will check-in at Government Circuit House. At the biggest river island, Majuli, you can visit the Kamalabari Satra and Auniati Satra that are major centers of Vaishnavite culture. Visit to these places would be conducted in the morning. Here you can enjoy the natural beauty and explore in and around of this region. After enjoying the day at a place exhibiting serenity, return to the Circuit House. In the evening, you can enjoy the cultural events by the local artists. An overnight stay at the Government Circuit House. In the morning, drive to Guwahati (340 km - 6hrs) and check in to your hotel. You can spend, rest of the day at leisure. In the evening, you can go for a River cruise in the Brahmaputra River and enjoy the sunset view. Later you can enjoy simple walks in the nearby areas, enjoy the local food, and talk to the locals. Return to your hotel for an overnight stay. Early morning visit the ‘Manchester of Assam’, Sualchuci. This place is very popular for producing some fine variants of silk. 'Eri' and 'Muga' are some varieties of silk that you can purchase as souvenirs. Later, also pay a visit to Hajo that is regarded as ‘all religion pilgrimage centre’. Here you will find numerous ancient temples and various sacred artifacts. Return back to your hotel for an overnight stay. In the morning, you will be provided on-time assistance and transfer to Guwahati Airport/Railway Station for onward journey. Notes: Months of September to April are best to visit.